Lake O’Hara is located in Yoho National Park in B.C. in the Rocky Mountains. The park is a place of awesome wilderness beauty. It was a favourite for painting in the past years by Group of Seven Artists J.E.H. MacDonald, Lawren Harris, Arthur Lismer, American artist John Singer Sargent and Banff artists Peter and Catharine Whyte, to name a few. 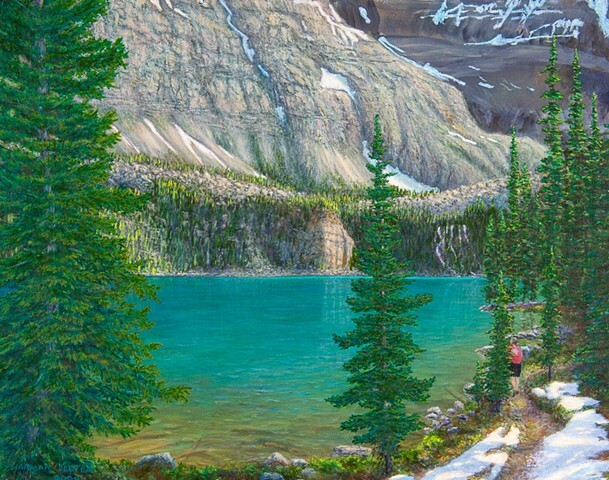 In my painting, I wanted to show a section of the Shoreline Trail, the alpine colour of the Lake and Seven Veils Falls.